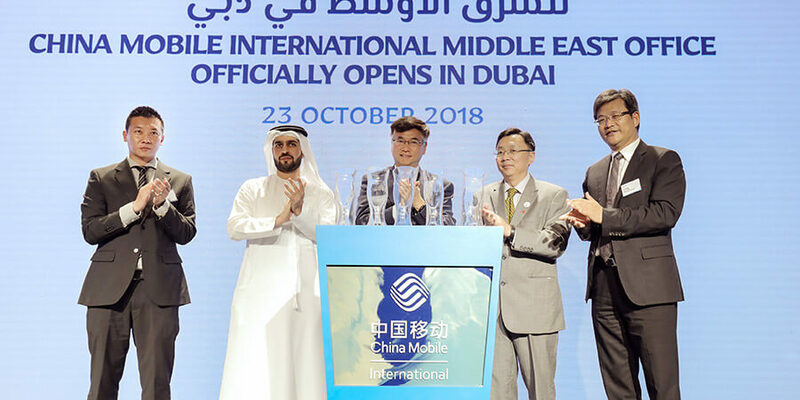 China Mobile International Limited (CMI) yesterday announces the launch of its Middle East office in Dubai, further deepening its investment and collaboration with the Middle East. CMI will work to deepen relationship with local operators and foster growth in size and diversity of products and services. In line with China Mobile's Big Connectivity strategy, CMI will explore investment opportunities in network infrastructure in the region. With an already established PoP in UAE, the company will look to further expand connectivity infrastructure to support of the growing ICT needs of Chinese enterprises present in the region. At the same time, China Mobile will work to bring its future technology products to the Middle East, including products relating to artificial intelligence and internet-of-things. Mr. Ni Jian, Ambassador of the People’s Republic of China in the United Arab Emirates; Mr. Ammar Al Malik, Managing Director of Dubai Internet City & Dubai Outsource City; Mr. Li Yue, President of China Mobile Communications Group Co., Limited; and Mr. Li Feng, Chairman & Chief Executive Officer of CMI together celebrated the monumental launch during a ceremony in Dubai. Ammar Al Malik, Managing Director of Dubai Internet City & Dubai Outsource City said, "We congratulate China Mobile International- one of the largest telecom companies in the world and who have been a business partner since 2015, on their expansion within the DIC community. Being the leading technology community in the region, our enabling ecosystem brings together technology innovators in supporting Dubai’s strategy of becoming the world’s smartest city. We look forward to increased cooperation with Chinese technology firms to accelerate the efforts of the UAE aimed at becoming one of the most advanced and innovative economies in the world." The Ambassador of People’s Republic of China in The United Arab Emirates, Mr. Ni Jian, said in his speech that the founding of China Mobile International Middle East has significant and far-reaching impact on the promotion of exchanges and cooperation in the field of information communication between China and the UAE. He hopes that China Mobile may, with its global network coverage, enrich the products and services in the UAE and the rest of the Middle East and guided by the principles of complementary advantages and win-win cooperation, actively cooperate with its Middle East counterparts in international business innovation, international transmission and interconnection as well as the sharing of network resources. Mr. Ni hopes that China Mobile may provide all-round quality services for clients from governments, enterprises and operators and work together with them in promoting information in China and the Middle East, so as to deliver greater synergy. Mr. Li Yue, President of China Mobile Communications Group Co., Limited said, "The rapid growth in trade between China and the Middle East has led to a rise in demand on telecommunication and data centers. Users from China and the Middle East have higher expectations on needs especially on data roaming services nowadays. With the opening of our Middle East office in Dubai, it marks an important milestone for China Mobile to expand its businesses to the whole Middle East. We will continue to enhance interconnection of network infrastructure, providing high-quality products and services to customers in Middle East. During the launch ceremony, government representatives from China and Dubai, as well as China Mobile representatives, poured sand into a capsule, which represents local influence, signifies the will of connection and partnership between China and the Middle East. CMI has become an exclusive gateway to expand China Mobile business to international markets, opening new businesses across the world. With this launch, CMI is on target to deepen its presence across the globe. Leveraging the strong network resources of its parent company, China Mobile, CMI will develop in-depth cooperation with local governments, carriers and enterprises to create synergies and serve more international customers. The company presently owns 40 submarine and terrestrial cables, with a total transmission bandwidth of over 30T; a total of 138 PoPs, covering 91 hotspot cities worldwide. With Hong Kong as its starting point, CMI will establish a global network for cloudification of data center, providing global access to its customers with large bandwidth connectivity. With increasing submarine and terrestrial cable resources and professional competence and products, CMI will provide comprehensive international telecom services and products and high-quality solutions for firms, operators, and individual customers.